We offer Security Monitoring to residents and businesses throughout Perth & Western Australia. We recommend Monitored Security, not just because it’s our specialty but because there are compelling reasons for having your security system Monitored by a trained individual rather than operating merely as a noisemaker. We already know that homes and businesses with alarms are far less likely to be burgled than those that don’t. But did you know that as many as three quarters of attempted burglaries that are abandoned are abandoned because of a ringing alarm? When a burglar sees signs and stickers from a security company they always have to wonder whether the system is active and Monitored. Criminals know that a Monitored Alarm is their worst enemy as it will bring down the heat faster than any other security approach and are most likely to move on to another target. A burglar needs less than 10 minutes to successfully conduct a burglary. That means every minute that goes by after entry is critical. 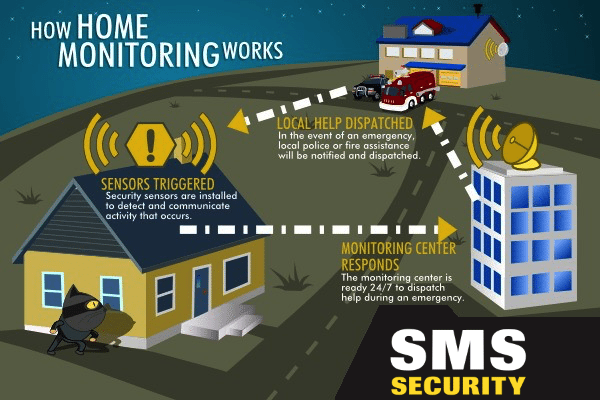 Monitored Security makes it possible for Monitoring Personnel to know quickly when a home or business has been breached and allows them to contact local authorities right away. In the event a burglar decides to take their chances, the likelihood of being caught goes up when Monitoring is in play. When Monitored Security includes video surveillance cameras, they create evidence that can be used for investigation and prosecution purposes. A Monitored Security system can offer additional benefits with different kinds of Monitoring above and beyond burglary. In fact it is common to include Fire and Medical Emergency Monitoring for customers where it is suitable. We are especially proud of Medical onitoring for those with chronic illnesses or families with senior residents. Medical Monitoring means that you are never alone, even when you or your loved one are the only one in the home. With just the touch of a button, help can be immediately dispatched in the event of an emergency. In the advent your property experiences a unique (not the whole suburb) AC power failure such as is indicative of a home fire or burglar attempting to cut the power before gaining entry our Monitoring Station will pay immediate attention and be at the ready to contact emergency and police services. Non-Monitored Alarms do without this additional protection. At the end of the day, a Monitored Security system is more than just a noisemaker. It is a system that connects your home and business to a Monitoring Centre where trained and experienced personnel are looking out for your safety. That protection extends beyond just those hours you are away; it also includes Monitoring while you are present. The peace of mind it offers is unbeatable. For more information on Security Monitoring be sure to give us a call – 08 9302 0000.